From left: Callophyrs augustinus and an empidid fly nectaring on Arctostaphylos viscida. Arctostaphylos viscida Parry (Sticky whiteleaf manzanita) is in full bloom here in Southerstern Oregon. Manzanitas are in the family Ericaceae, which includes related genera Arbutus (madrone, strawberry tree), Calluna (heather), Erica (heath), Kalmiopsis, Pieris, Rhododendron (includes azaleas), Vaccinium (blueberries, cranberries, etc. ), and over a hundred more genera, few of which known in cultivation. A. viscida is native from Southwestern Oregon south through most of California (to Kern County, possibly further south). It is a shrub or small tree, sometimes reaching a height of fifteen feet in optimal conditions, shorter further south. Small panicle-like clusters of urn-shaped flowers appear in Spring. The entire inflorescence is sticky, covered in glandular hairs, with glaucus leaves, thus the common name. Sticky whiteleaf manzanita grows in association with oak (Quercus), Pacific madrone (Arbutus menziesii), various conifers (Juniperus, Pinus, Pseudotsuga), and Ceanothus among others. With many of these, it shares a variety of endo- and ectomycorrhizae, which are types of fungi which survive on or within the roots of a host and trade valuable nutrients (as well as increasing the surface area of the roots) for carbon and other exudates (root secretions). Dozens of species of mycorrhiza have been discovered in association with Arctostaphylos and associated plant species. Essentially, mycorrhizal fungi are symbiants which infect their hosts, but they benefit the plants in multiple ways and are necessary for the establishment and survival of countless taxa in the plant kingdom. Like all ericaceous plants, Arctostaphylos requires symbiosis with specialized ericoid mycorrhizal fungi to survive in the acidic and nutrient poor soils they are typically found in. Arctostaphylos viscida is a pioneer shrub, entering the landscape in succession following grasses and other herbaceous plants. A. viscida paves the way for trees such as Douglas-fir (Pseudotsuga menziesii), and contributes to its establishment by hosting the necessary mycorrhizal fungi that Douglas-fir requires to survive. The same group of mycorrhiza also aids in the establishment of Arbutus menziesii, a relationship which may explain why madrone is so difficult to keep alive in cultivation (lacking the correct mycorrhizal symbiosis outside its native range). Flowers of Arctostaphylos viscida with banded thrips, Aeolothrips sp. The flowers of Arctostaphylos viscida are similar to many (but not all) ericaceous plants such as Arbutus, Pieris, and Vaccinium by having fused petals forming an urn or cup, a stigma nearly twice the length of the stamen, and a ring of stamen surrounding the ovary and nectaries. Manzanita pollen is dehisced through small pores and often requires sonication, or buzz pollination, to release the pollen. Small insects such as thrips, which are small enough to crawl into the flowers, can gather pollen without the use of sonication. A. viscida may occasionally be self-compatible but progeny probably benefits most from cross pollination between different plants. Bloom time varies between individual specimens, as does the relative attractiveness to pollinators due to unknown factors that may include the health of the plant, quality of the nectar, or something else entirely. The bark is similar to that of madrone (Arbutus menziesii): cinnamony, thin, and smooth once the outer layer of bark peels off. It has the unique characteristic of repelling water. This feature may contribute to the plants ability to survive in severe drought, though if there is inadequate rain or sun they do not flower well. Arctostaphylos viscida shrubs that grow on the north side of structures or under dense canopies of trees do not seem to flower reliably. The excessive shade from a northern exposure or tall trees promotes fungal infections that result in aborted buds and black spots on the leaves. A. viscida prefers open sunny habitats, and is more fit in chaparral than in dense woodlands, though it does perfectly well at forest edges, clearings, and slopes which in some aspects have similar characteristics to true chaparral. From left: A. viscida berries, crushed dried berries, and seeds. Seeds of Arctostaphylos are produced in the form of berries. In A. viscida the berries are sometimes sticky, but this seems to go away when the fruit is mature. There is speculation that the berries (and seeds) are distributed by animals, probably birds. Laboratory tests of seed procured from coyote feces (what a fun job that must have been) found low germ rates. Birds are more likely, as the berries would likely pass through quickly (acid treatment in a lab helped break seed dormancy). Fire is another treatment that helps scarify the seed and break dormancy, and has the added benefit of reducing competition (especially tree saplings) which would otherwise shade out the slow growing manzanita. Suppressing fire is probably hindering the development of new colonies of manzanita. By briefly examining many of the stands in my area, it is difficult to find small young plants, but mature plants 6' or taller are common. Many insects, including the introduced European honey bee (Apis mellifera), visit manzanita flowers where they are abundant. An individual plant can produce hundreds of thousands of individual florets that open over the span of a few weeks. Bees and flies are the most common visitors to the flowers, though the abundance of either depends largely on the surrounding habitat. For example, plants growing among conifer forests may have more flies than bees, since conifer forests tend to support less bees than do chaparral or oak woodlands. Honey bees will work the flowers when both are abundant, though in dry years they may not be able to reach the nectar since most plants produce less nectar in drought. Other insects occasionally bite holes in the sides of the flowers to reach the nectar, and when that happens honey bees will gain access to the nectar through the side as well though it is unlikely they will create the holes themselves. A bumblebee queen, Bombus vosnesenskii, collecting nectar. The primary pollinators of manzanitas are typically medium and large bees which are capable of sonication, or buzz pollination. The bee lands on the flower and vibrates the flight muscles which releases a burst of pollen from the pores in the anthers. A positive electric charge (which all flighted insects generate) helps the pollen cling to the bee. Bumble bees (Bombus), mason bees (Osmia), digger bees (Anthophorini), and long-horned bees (Eucerini) are capable of sonication and I have observed all visiting A. viscida in my observations. Male Andrena sp., robbing nectar through a hole in the side of the flower. Many smaller bees visit the flowers, and in my observations many of them are nectar thieves. It's unclear who is chewing the holes in the flowers, but once they are there the flower has a low chance of getting pollinated since most of the visitors to those flowers bypass the reproductive structures and feed on nectar through the hole. A cuckoo bee, Nomada sp., robbing nectar from a hole in the floret. I have personally observed many types of small bees visiting A. viscida including mining bees (Andrena), small carpenter bees (Ceratina), and cuckoo bees (Nomada). Cuckoo bees are kleptoparasitoids, like cuckoo birds, who lay their eggs in the nests of other bees. Cuckoo bees forgo the creation of their own nests, and do not collect pollen. Instead, cuckoos rely on the provisions supplied by host species, usually other closely related bees. The invader sneaks into the nest while the host is out and lays an egg in a cell chamber. When the cuckoo bee larvae hatches, it kills the host larvae then feeds on the host provisions and develops in the host nest until adulthood. The genus Nomada, sometimes called nomad bees, are in the Apidae, the family that includes honey bees, bumble bees, digger bees, carpenter bees, and a few more. Mining bees, Andrena, are typical hosts for nomads, but others include Agepostemon (green metallic sweat bees) and a few others. From left: a mason bee, Osmia sp., perched on a leaf, and a paper wasp. Many types of bees mate on and around wildflower patches, and this includes manzanitas in full bloom. I have captured and observed male mason bees (Osmia), male long-horned bees (Eucerini), male mining bees (Andrena), and male carpenter bees (Ceratina) in close proximity to A. viscida. Many mate while foraging, unlike honey bees. While honey bee queens mate with several males and don't forage, the majority of native bees mate with a single male while foraging. Male honey bees, or drones, mate with a single queen and then die, while the majority of native bee males mate as much as possible with as many females as they can mount. Vespid wasps are typically just getting started while A. viscida is in bloom in Southern Oregon. Females which hibernated through winter are just beginning to emerge pending good weather, and they are keen on acquiring the much needed carbohydrates supplied by flowers in the form of sugary nectar. The beginning of the year for yellowjackets and paper wasps is not dissimilar, as mated females must create their nests and feed the first of their offspring before matured workers are able to take over the foraging responsibilities so the queen can stay home and devote the remainder of her life to laying eggs. Yellowjackets, genus Vespula, are similar to honey bees in that there are distinct castes (reproductive queens, males, and workers). If yellowjacket workers do lay eggs, they will only rear male offspring since the workers are not equipped to mate. Paper wasps (Polistes and Mischocyttarus) have females that are all capable of mating and thus laying both male and female offspring. While there are no true paper wasp queens, a dominant laying female asserts her sovereignty by fighting with competing females (size is often a factor of success). Many parasitoid wasps congregate on and around A. viscida for nectar and honeydew, as well as to seek out hosts. I've observed ichneumonoids and chalcidoids either seeking hosts or seeking sustenance. Many suitable hosts are found on A. viscida, including many lepidopteran caterpillars. Male ant, Lasius sp., stuck to the sticky inflorescence. 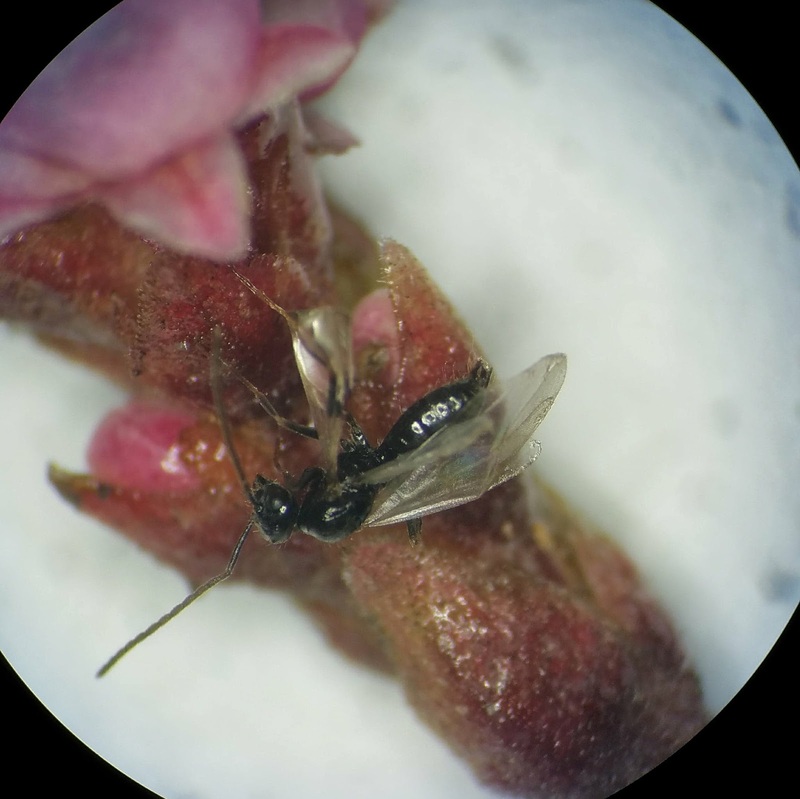 The sticky inflorescences of A. viscida trap many small insects, notably small flies and winged ants. Winged ants were one of the unfortunate insects to get stuck to the inflorescence. Ants in the genus Lasius are often attracted to honeydew, the frass of sap sucking insects like scale or aphids. Subterranean species of Lasius feed on the honeydew of root feeding aphids, forming mutualistic relationships. Flies visit A. viscida flowers frequently, and may also be gathering around the plants to mate or seek out prey (predatory species). More diverse and speciose than bees, flies are reliable pollinators in climatic conditions not accommodating to most bees. Many flies mimic bees and wasps, although flies are incapable of stinging. Bee flies, Bombyliidae, not only do a good job at mimicking bees, some are even parasitoids of ground nesting bees. Dagger flies, or dance flies, are named for the long rigid proboscises they possess and the distinctive courting rituals performed by the males. Not all species have a long proboscis, but those that do use them to probe flowers for nectar. I have seen them visiting many early blooming trees such as Prunus and Salix, and early blooming ephemerals like Crocus and Muscari. They are also predatory, feeding on smaller flies, while larvae feed on decaying matter in the soil. I've seen several dead flies clinging to leaves and flowers, having been infected with the fungi Entomophthora. Spores are forcibly ejected from specialized structured grown by the fungus from membranous sections of the abdomen. Flies under or downwind may inadvertently catch a spore which proceeds to grow into the unsuspecting fly. The fungal hyphae gradually grow throughout the entire body, digesting the flies organs, and when it reaches the brain causes the fly to land and climb upwards. When the fly dies, after about a week from becoming infected, spores are produced and the cycle is renewed. Entomophthora isn't restricted to flies, some species infect aphids, mites, grasshoppers, and others. A handful of moths in the Noctuidae and Geometridae use A. viscida as a host plant. Caterpillars are often difficult to see unless one is seeking them out, due to their drab colors and patterns. Adult moths of various types visit the flowers for nectar. During warm weather, butterflies visit the flowers. I have found this to be true only in clearings with a lot of direct sunlight. Manzanitas that receive only filtered light appear to be less attractive to butterflies. Adult butterflies were seen sunbathing as well as nectaring, while on a few occasions males attempted to defend their territory from other species. I suspect courtship may also occur in the vicinity as well, though I didn't observe it directly. California tortoiseshells, Nymphalis californica, overwinter as adults and benefit from access to early nectar sources such as A. viscida. Mayflies live for about a day as adults, and are incapable of eating. Thus, a mayflies presence on A. viscida flowers was purely coincidental. Mayflies spend one to several years as aquatic nymphs before reaching adulthood, feeding on algae and detritus from under rocks at the bottom of streams, rivers, and occasionally lakes. Thrips, at least in some areas, are very numerous on and within the flowers of A. viscida. Thrips feed primarily on plant tissue, including flowers, buds, and pollen. But despite their reputation, they may also be pollinators. Thrips have been demonstrated to be pollinators of many plants in many regions of the world, from tropical environments to high altitude and high latitude alpine and tundra landscapes, respectively. They may also be some of the most ancient pollinators. Whether or not they benefit A. viscida through direct pollination or not, they may serve the plant by attracting hummingbirds which feed on them as well as feeding on nectar, facilitating pollination. Rufous and Anna's hummingbirds, Selasphorus rufus and Calypte anna, respectively, are suspected to feed on both thrips and nectar during their visits. Conversely, high numbers of thrips on a particular inflorescence appear to keep other pollinators (i.e. bees) from visiting that inflorescence in my observations, although the thrips occupation varies from inflorescence to inflorescence on a single plant. Eliyahu, Dorit, Andrew C. McCall, Marina Lauck, and Ana Trakhtenbrot. "Florivory and Nectar-robbing Perforations in Flowers of Pointleaf Manzanita Arctostaphylos Pungens (Ericaceae) and Their Effects on Plant Reproductive Success." 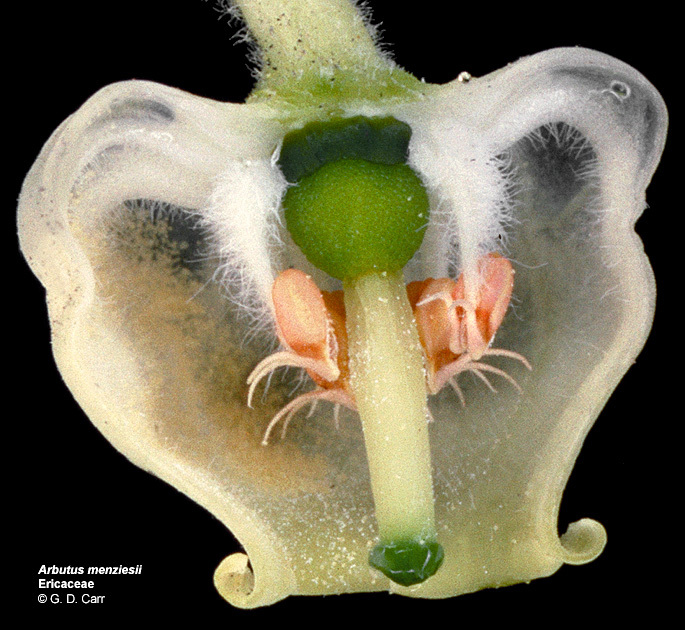 Arthropod-Plant Interactions 9.6 (2015): 613-22. Web.